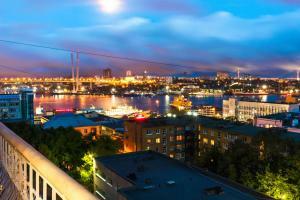 Teplo Hotel is located in the historical centre of Vladivostok, within a 5-minute walk of Vladivostok Train Station. Free WiFi access is available. The rooms are decorated in bright colours and feature a TV, kettle and fridge. The bathroom comes with a hairdryer and free toiletries. At Teplo Hotel you will find a 24-hour front desk, a terrace and a shared kitchen. Other facilities offered at the property include a shared lounge, a games room and a tour desk. Vladivostok International Airport is 51.5 km away. When would you like to stay at Teplo Hotel ? This room features a TV, kettle and fridge. The bathroom comes with a hairdryer and free toiletries. This air-conditioned room has an electric kettle, fridge, desk and TV. A private bathroom comes with a hairdryer and free toiletries. This twin/double room has a electric kettle, kitchenware and air conditioning.Please note that there is no window. Payment before arrival via bank transfer is required. The property will contact you after you book to provide instructions. Please inform Teplo Hotel in advance of your expected arrival time. You can use the Special Requests box when booking, or contact the property directly with the contact details provided in your confirmation. Guests are required to show a photo identification and credit card upon check-in. Please note that all Special Requests are subject to availability and additional charges may apply. Each day we'll check prices and send you an email for your selected dates at Teplo Hotel. If you don't have specific dates but would like to check prices for say next weekend or say next month we can check the price too. Click to write a review and share your experience of Teplo Hotel with other travellers.